Another week. Another Wednesday. Another Wednesday Comics. Recently the good folks at DC's blog, 'The Source' asked for people to submit pictures of themselves or friends reading Wednesday Comics. You can see some of the results of that here and here. I couldn't resist getting some of my friends in on that photographic action. 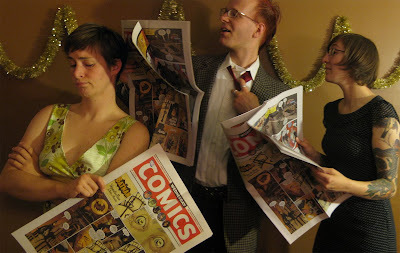 So here's a picture of pals Maris, Liz and Tim in the outfits they wore for reference on page 1 reading Wednesday Comics. Whew. So great. Thanks so much for showing the original side by side. 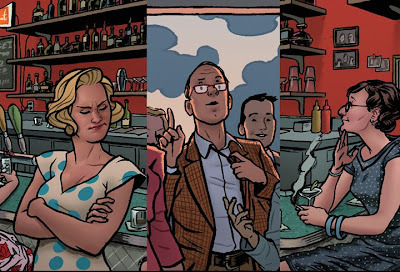 Joe, thanks for sharing all of the art and in-progress material. 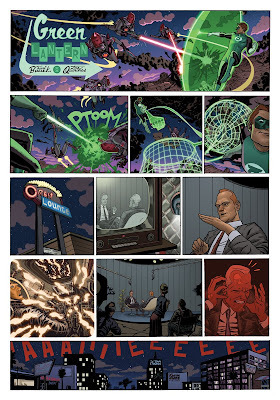 Really enjoying your GL work on Wednesday Comics! Loving your work on this! 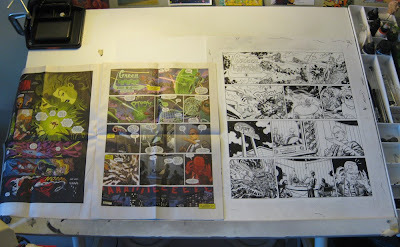 I notice that the cropping of panels in the b&w art is slightly different than in the final printed piece. Did you add in the extra information digitally or redraw the panels?